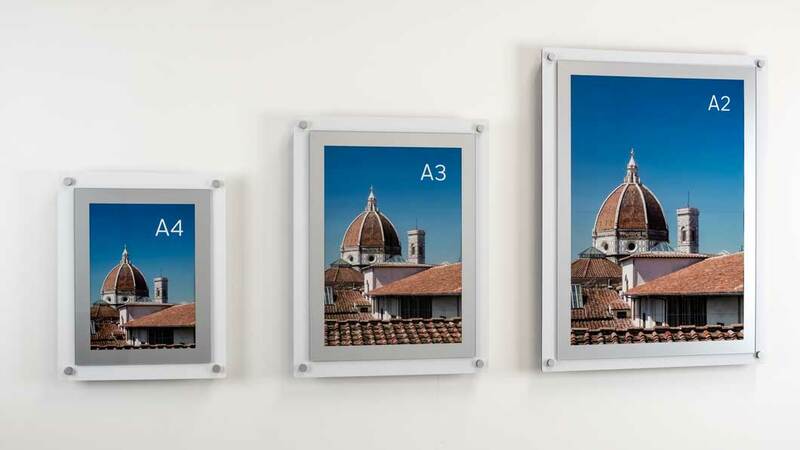 We make two models of poster frames using either clear acrylic or aluminium composite. 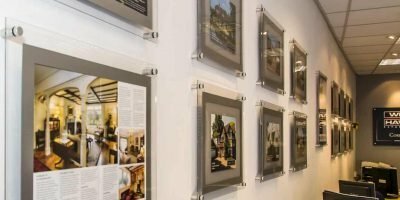 They provide an elegant poster display solutions for public areas such as showrooms, reception areas and marketing suites. 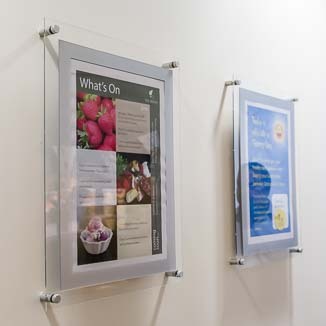 Posters are sandwiched between a clear acrylic front sheet and support panel. Available in A2, A3 & A4 sizes. 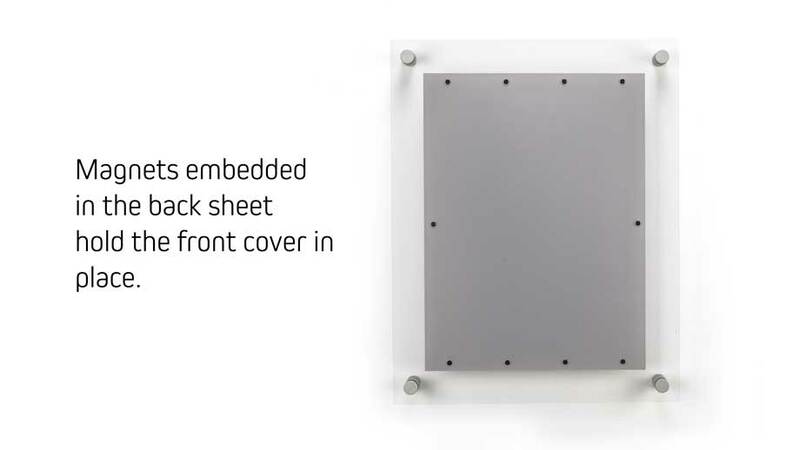 Can be installed in either portrait of landscape format. Supplied with four satin finish aluminium wall fixings. 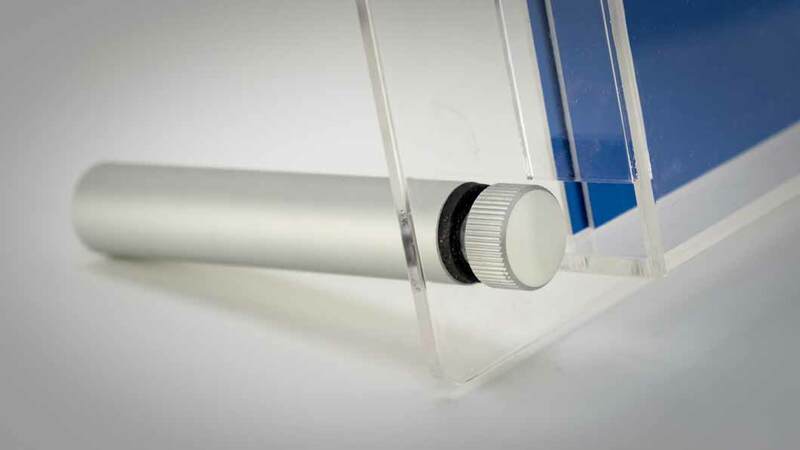 Poster holders are made from either clear 3mm perspex acrylic or opaque 3mm white aluminium. The aluminium model is cheaper. Stand off fixings and acrylic front frame are the same for both models. 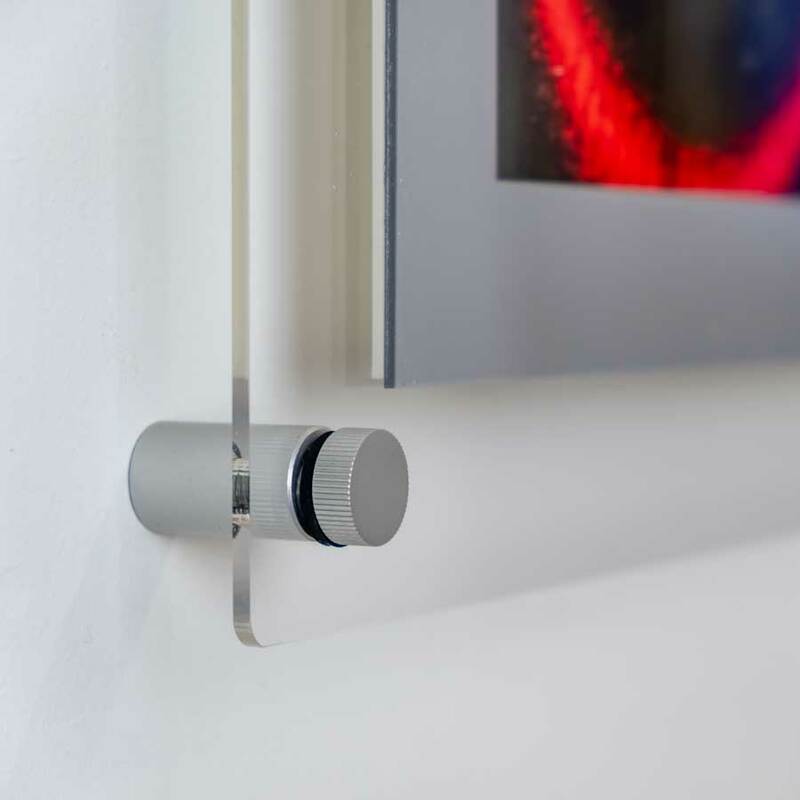 All models are available as wall fixed displays. 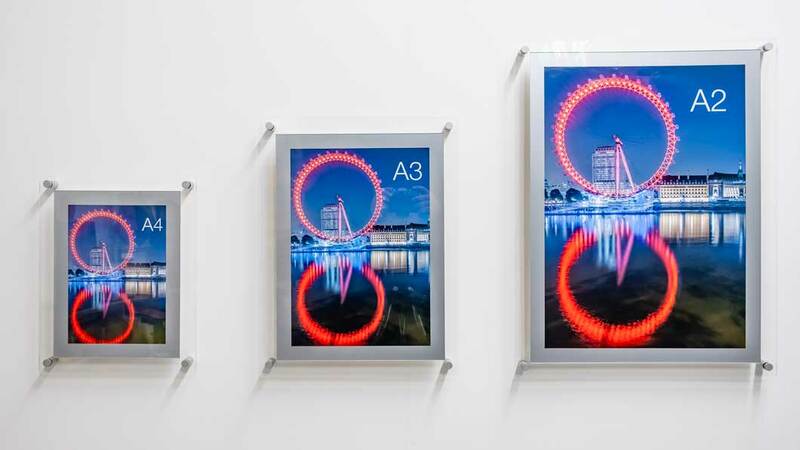 A3 and A4 sizes are available as desktop poster displays. We use super strong neodymium magnets to hold the front cover in place. 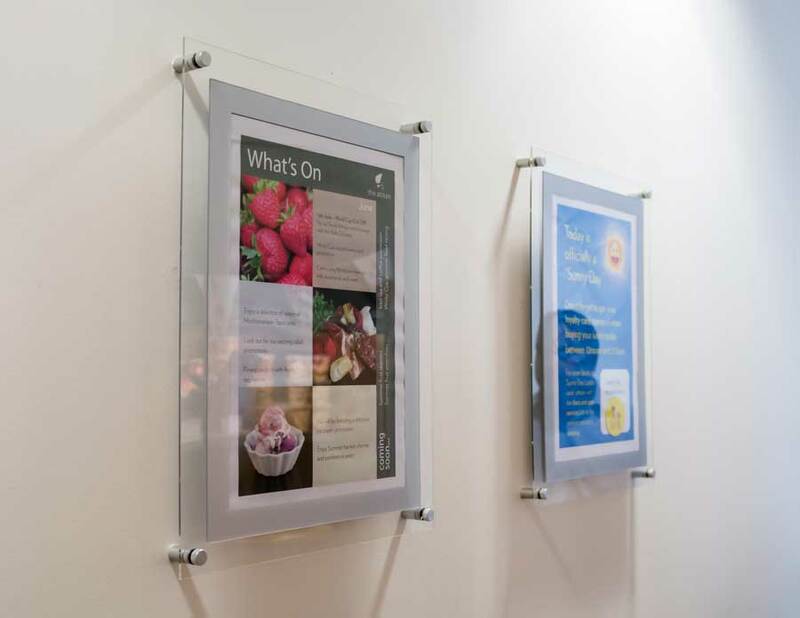 Front frame is made from 2mm clear acrylic with an opaque screen printed silver border to frame your poster graphics. 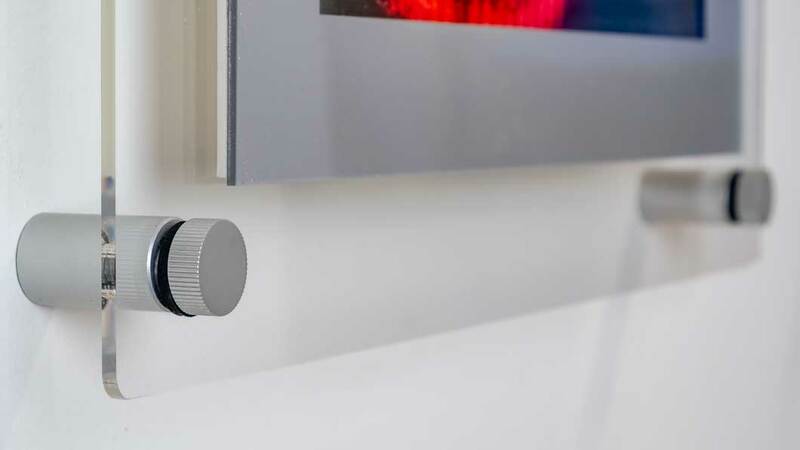 We manufacture our own wall fixing which are slightly larger than the normal off the shelf ones . They also feature a knurled screw so they tighten easily. 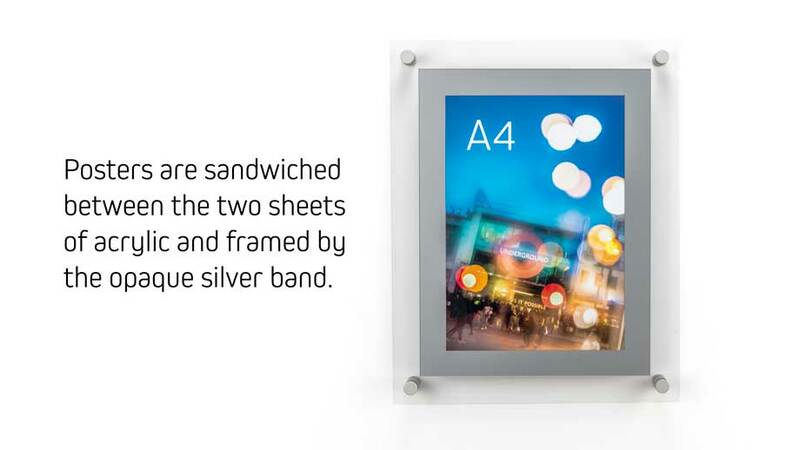 Ideal for displaying photographs, marketing literature & temporary signs. 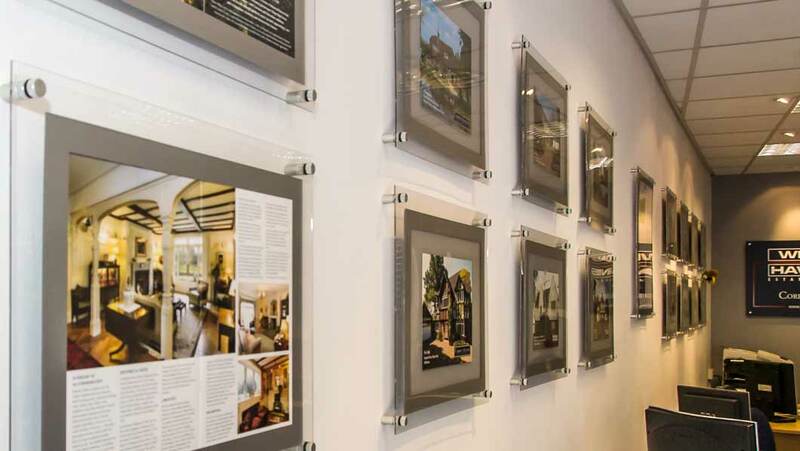 Wall mounted poster displays are also ideal for property promotion in estate agents. 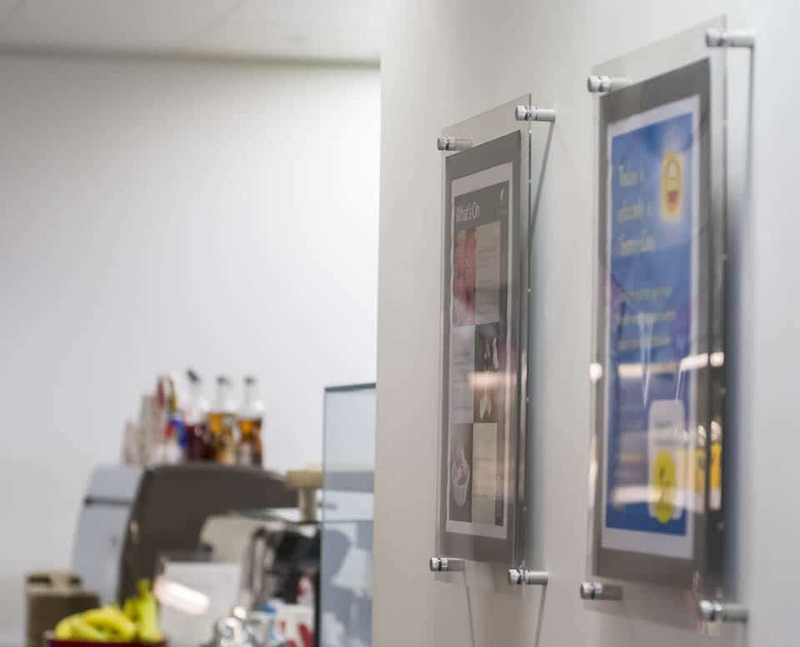 Dealing directly with us means you get the best prices and quick service from our London office. 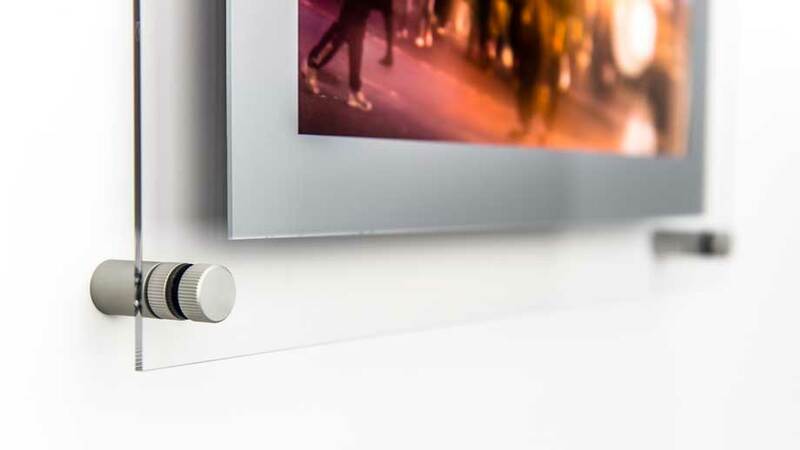 The quick change magnetic system means posters can be changed in seconds. 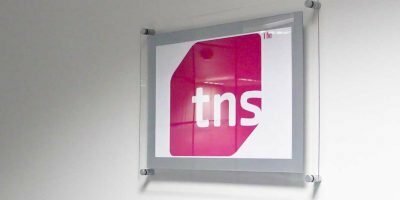 A simple and stylish way to add graphics into a corporate interiors. Q. 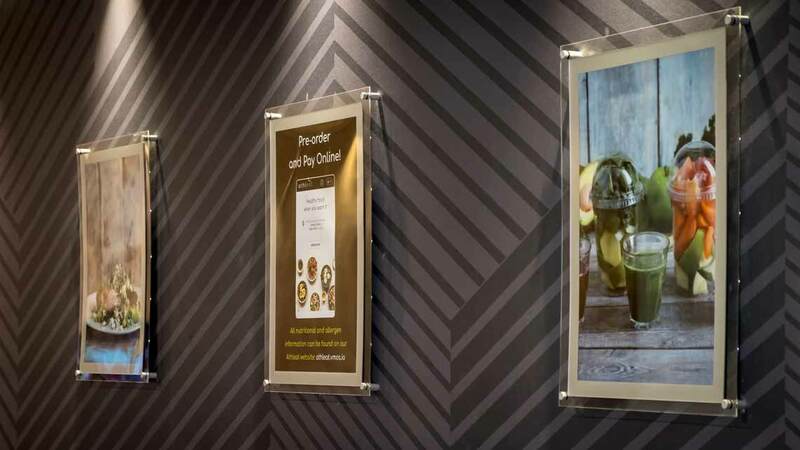 How quickly can a wall mounted poster frame be fitted? Allow 10- 15 minutes for installation. Q. 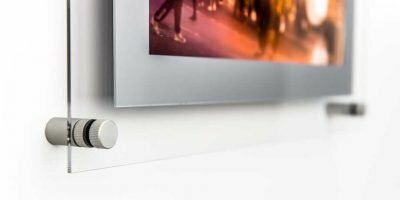 What tools will I need to install the acrylic poster frame ? Q. Any tips for the installation? Use the poster back to mark where the fixings go on the wall. Use a spirit level to make sure the unit is level. Q. My poster is a bit squint in the frame? Use a bit of masking or magic tape to stop the poster slipping. 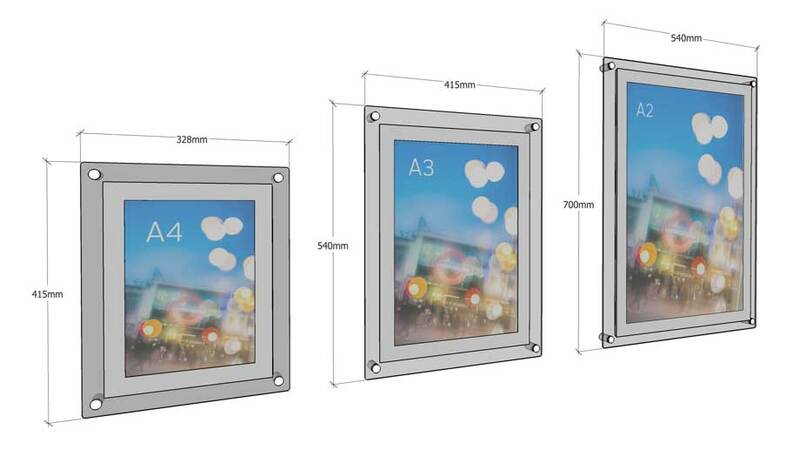 Its shown above in the exploded illustration of the A3 Poster Frame. Q. 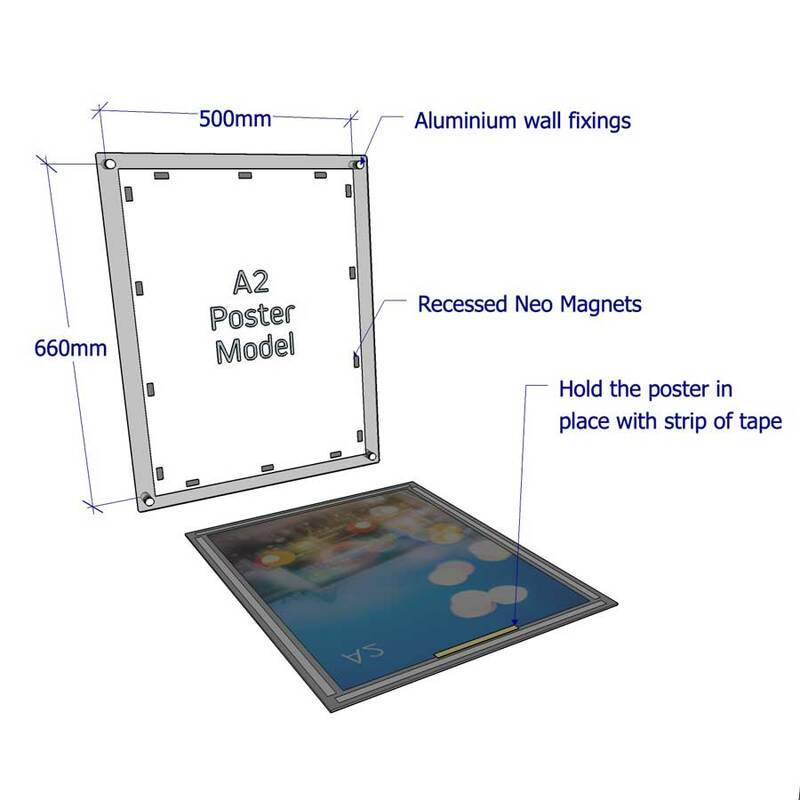 Do you stock any other sizes of Poster Holder other than A4, A3, A2 and A1? Q. 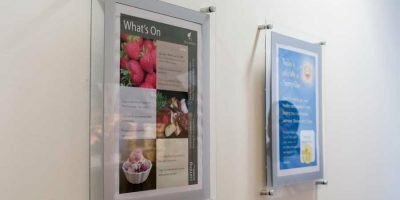 How quickly can I get hold of a Poster Display? Q. 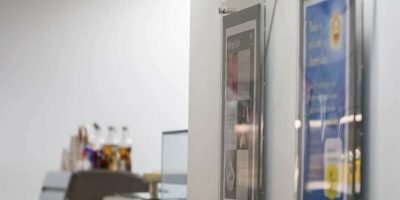 Any tips on keeping perspex poster holders clean? Use a soft cloth and either some glass cleaner or we use methylated spirits. Avoid using anything that could scratch the acrylic like a scourer or even rough paper towel. Q. Someone has scratched the acrylic, can it be repaired ? Yes you can repair light scratches by rubbing Brasso in a circular motion. For deeper scratches, visit this page for advice on acrylic scratch removal. Q. 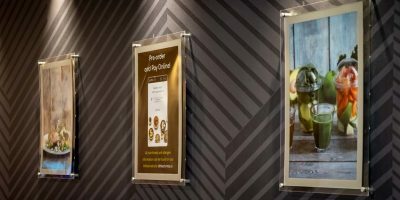 Can Dimensions Displays print my poster artwork?